With its idyllic beaches, stunning mountains, and everything else in between, New Zealand is undoubtedly one of the most beautiful countries in the world. Its lakes are some of the clearest, bluest, and most picturesque you’ll ever see, and are well worth including in your travel plans. 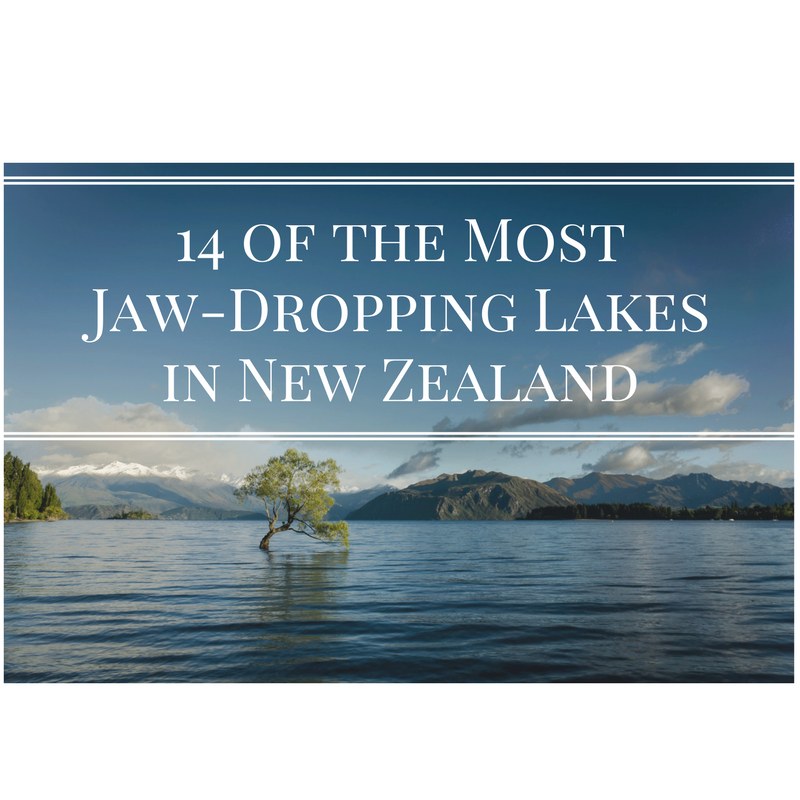 Below are 14 of the most beautiful lakes in New Zealand. The list is by no means complete, because that would mean including hundreds. The images are actually photo spheres, so you can rotate them 360 degrees with your mouse if you are on desktop. If you are on a mobile device, you can look around the location by tilting your phone or tablet. Located in the impressive Alps in South Island, Lake Wanaka is the fourth largest lake in New Zealand, and a magnet for visitors around the world. The region is very popular for outdoor enthusiasts, but also for people looking for a relaxing holiday, who are attracted by its tranquility. Travelers here can explore the nearby Mt Aspiring National Park, discover native forests, or hike one of the many trails. Adventure seekers can go canyoning, skydiving, kayaking, paddle boarding, etc. During winter, skiers from around the world also come to the region. Located in the southwestern corner of the Otago region in South Island, Lake Wakatipu is the longest lake in New Zealand. It has a total length of 80 kilometers, and is also the third largest lake in the country. With the Remarkables mountain range at its southeastern edge, Lake Wakatipu is extremely beautiful. Queenstown, one of the main attractions for visitors in New Zealand and also known as the adventure capital of the world, sits on the shores of Lake Wakatipu. Needless to say, there is an abundance of entertainment opportunities here. Also located in the South Island, Lake Tekapo has a surface area of 83 square kilometers (32 square miles). It sits on the the northern edge of the Mackenzie Basin at an altitude of 710 metres (2,330 feet). The water of Lake Tekapo boasts an amazing turquoise color, which comes from glacial sediments. On a clear day, the tallest mountain in New Zealand, Mt. Cook, can be seen in the distance. Although it’s a hot spring rather than a lake, Champagne Pool couldn’t be left out of this list. Located in North Island 30 km (20 miles) southeast of Rotorua, Champagne Pool was formed 900 years ago by a hydrothermal eruption. This young body of water measures 65 meters (213 feet) in diameter, and reaches a maximum depth of 62 meters (203 feet). Champagne Pool looks a lot like a glass of bubbling champagne (hence the name), which is due to the abundant efflux of carbon dioxide. The geothermal water below the hot spring reaches 260 °C (500 °F), and water temperature at the surface measures between 73 °C (163 °F) and 75 °C (167 °F). Mount Cook, the highest mountain in New Zealand, stands at the head of the lake, offering an incredible backdrop. So it’s easy to see why Peter Jackson chose this part of the Southern Alps as the setting for the lake town in the movie “The Hobbit: The Desolation of Smaug”. Located on the West coast in central South Island near the Fox Glacier, Lake Matheson is particularly famous for its reflected views of Mount Cook and Mount Tasman. The area around the lake is surrounded by native kahikatea (white pine), rimu (red pine) trees, flax, and a variety of New Zealand fern species. The lake itself is home to many water birds, and contains long-finned eel. If you want to immerse yourself in the surrounding nature, you can take the 1.5-hour Lake Matheson Walk, and get inspired by the unsurpassed views and mountain reflections from the forested shores of the lake. Lake Hawea runs parallel to Lake Wanaka, and at their closest point the 2 lakes are just 1 kilometer apart. Lake Hawea covers an area of 141 square kilometers (54 square miles) and reaches 392 meters in depth (1,286 feet). Lake Hawea is a paradise for outdoor adventurers and a great place to boat, kite surf, swim, kayak, walk, ride, or just enjoy a tranquil day at the beach. Lake Waikaremoana is not as famous as the other lakes on this list, but it’s equally scenic. Located in the Te Urewera National Park in the North Island, the lake is surrounded by a green world of pristine ancient forests and wetlands. Its name, translated from the Maori, means “sea of rippling waters”. One of New Zealand’s “Great Walks”, the Lake Waikaremoana Track, follows half of the lake’s circumference. Totalling approximately 43 kilometers (27 miles), the track is normally completed in 4 days and offers scenic views over the lake. The Emerald Lakes are located in North Island on the most popular one-day hike in New Zealand, the Tongariro Alpine Crossing in Tongariro National Park. Incredible volcanic scenery unfolds throughout the entire hike. The Emerald Lakes are almost halfway through the hike, 9 kilometers from its starting point and 10.4 kilometers before the finish. On days with good weather, the hike is very popular and packed with people. Lake Tikitapu (also known as Blue Lake), gets its color and name from rhyolite and pumice deposits on the lake bed. It is the smallest of 4 lakes that lie between Lake Rotorua and Lake Tarawera in the Bay of Plenty region of the North Island. The clear waters of the lake are popular with water skiers, boaters, and swimmers. If you are in the mood for a hike, an easy walking track circles the lake. Along the track you can admire beautiful beaches, native bush, and the exotic conifers of Whakarewarewa Forest. Lake Rotoiti is located in South Island’s Tasman Region, in the Nelson Lakes National Park. The lake, which was previously known as Lake Arthur, reaches a maximum depth of 82 meters (269 feet). Not to be confused with the North Island’s lake that bears the same name, which is located in the Bay of Plenty region, and is also spectacular. Tasman Lake is the result of the recent retreat of the Tasman Glacier in New Zealand’s South Island. While in the early 1970s there were only several small meltwater ponds on the Tasman Glacier, by 1990 these ponds had merged into Tasman Lake. Tasman Lake is part of Aoraki/Mount Cook National Park. Boat tours among the icebergs on the lake are very popular among tourists. Located in the North Island in the caldera of the Taupo Volcano and about the size of Singapore, Lake Taupo is the largest lake in New Zealand in terms of surface area. It covers a surface area of 616 square kilometers (238 square miles) and reaches a maximum depth of 186 meters (610 feet). The magnificent Huka Falls, New Zealand’s most visited attraction, is situated just North of Lake Taupo. The lake is very popular for sailing, kayaking, water-skiing, and fishing. The Maori rock carvings, which can only be seen from water, offer a great opportunity for a boat trip or kayaking excursion. The forests surrounding the lake offer hiking and mountain biking for all experience levels. Lake Tarawera is located in the North Island 5 kilometres (3.1 miles) to the West of Mount Tarawera volcano, and 18 kilometres (11 miles) to the East of Rotorua. The lake has a surface area of 41 square kilometres (16 sq miles) and reaches a maximum depth of 88 meters (289 feet). Lake Tarawera is particularly famous for some of the best rainbow trout fishing in New Zealand. It is also popular for its water sports, walking tracks, and family friendly activities. The lake also has a unique geothermal activity, which heats up a secluded beach on the shores of the lake called the Hot Water beach, which can be accessed by the Tarawera Trail.